I moved to Savannah, Georgia just before Christmas last year, and began a new full-time job in March. When you work from 8 a.m. to 5 p.m., the lunch hour is always a bright spot during the day. Local restaurants are the jewels of small towns. You may have your go-to dish at a well-known chain, but exploring indigenous places to eat–that’s where the magic happens. The truth is, I love Red Lobster’s Seaside Shrimp Trio and the Crispy Chicken Tacos at Chili’s. I can’t go to Cracker Barrel without ordering hash brown casserole as my side dish. However, no matter where I travel, these great restaurants will only offer more of the same. To understand the real picture of a city’s culture, people and food, you’ve got to venture outside the chain-restaurant-comfort-zone. It’s there, at places like downtown Statesboro’s 40 East Grill, you’ll find homegrown flavors, and in this case, experience the true vibe of small town America with a modern twist. Offering lunch and dinner, 40 East Grill opened in August 2012. With a locally focused menu that changes every few months, they pride themselves on cooking with a fusion of native products featuring B&G Honey Farm, cheese from Flat Creek Lodge and beef produced by Southeast Georgia farmers. Chicken and seafood are other great options. 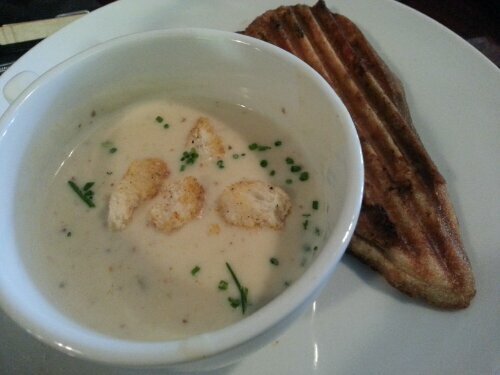 My go-to lunch combo is She Crab Soup paired with the Three-Cheese Panini, pictured below. I often add a side of crispy sweet potato fries to round out the meal. My co-workers and I have made 40 East Grill a regular lunch stop. It makes for a fantastic date night too. The menu, presented on a clip board with a clothes pin, even includes fun drink choices outside the norm, like an Arnold Palmer (half tea/half lemonade) or blended coffee. Most recently, they’ve added a bacon, egg and cheese sandwich to the menu! That’s not something you see every day and that’s exactly what’s to love about 40 East Grill…it’s creative, classy and unpredictable. The restaurant’s best sellers include the Southern River Farms Ribeye , Chicken Pot Pie and the Maryland Style Jumbo Lump Crab Cakes topped with a lemon beurre blanc. Buffalo chicken sandwich served with crispy sweet potato fries. The buffalo chicken sandwich is topped with a cold tomato slice and ranch dressing. A great lunch combo! She Crab Soup with half a sandwich. Grilled ham & cheese panini. Warm, crunchy and melt-in-your-mouth fabulous. Dinner is served! Pasta in a tomato-based sauce topped with Parmesan cheese. Utensils are bundled in black napkins with a clothes pin. It’s all in the details! The featured wall art was created by Georgia Southern University’s Art Department. A typical mid-day crowd at 40 East Grill. Community support and outdoor dining are big attractions. The front entrance is bright with natural light. 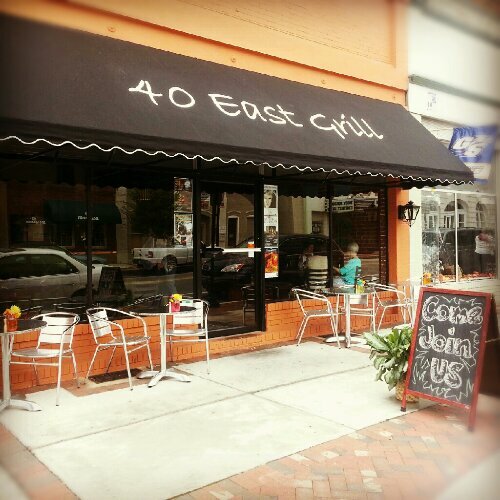 40 East Grill has a quaint, urban feel that’s trendy and warm with exposed brick throughout, a welcoming chalk board at the entrance that lists daily specials, original hardwood floors, earthy paint colors and modern lamp lighting. Outdoor seating is available with a great view of downtown Statesboro, onlooking the Emma Kelly Theater and Averitt Center for the Arts. Live music happens often too, varying from country, rock and bluegrass. Even the talent is local! Additionally, the ladies restroom is among the cutest I’ve seen complete with a luxurious crystal chandelier and vessel sink. Happy hour is every evening from 5 – 7 p.m. Stop in for a signature cocktail at the 18 foot copper top bar, like the 40’s Perfect Margarita or Cucumber Melon Martini. During Happy Hour, wells and house wines range from $2 – $3. Not quite ready to go home? Stay for chicken parmesan or a 12-ounce bone-in, pan seared pork chop and watch a game on the flat screen TVs. 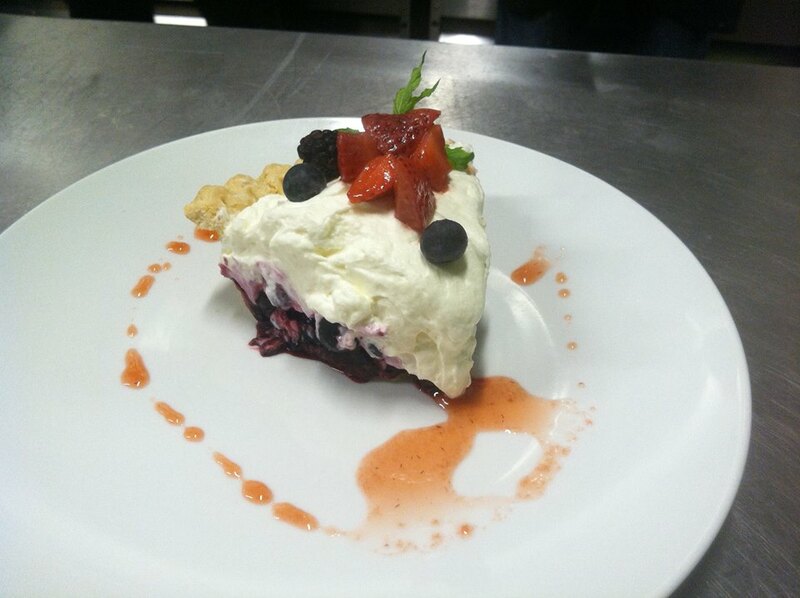 Wild Berry Pie filled with fresh blueberries and blackberries, topped with whipped cream cheese. Photo credit: 40 East Grill. Aside from delicious food, the thing that sets 40 East Grill apart is the service. Time and again, I’ve been impressed by the servers’ attention to detail and willingness to go the extra mile. They’re consistently well dressed, friendly and accommodating. The restaurant is open Monday – Friday from 11 a.m. – 2 p.m. and 5 – 9 p.m., also on Saturdays from 5 – 9:30 p.m. When quality like this exists in your own neighborhood, it’ll make you think twice before venturing out-of-town.